The solution was to opt for cord pieces. Corduroy was all the rave last year, but for many of us it was nothing new. Many of us never really stopped wearing it. If you are lover of vintage, the chances are that wearing cord pieces is second nature to you. This material is typically quite warm and comfortable. This makes it ideal for spring. You can put on a nice pair of cord jeans and a cord jacket and you can get that cool casual vibe going, without having to risk getting a cold. I liked the idea of pairing it with a scarf and straw accessories, creates a bit of contrast. I added the scarf to this outfit for the sake of comfort and warmth ( I always feel warmer when I'm wearing scarves) and even if this scarf is really a foulard. 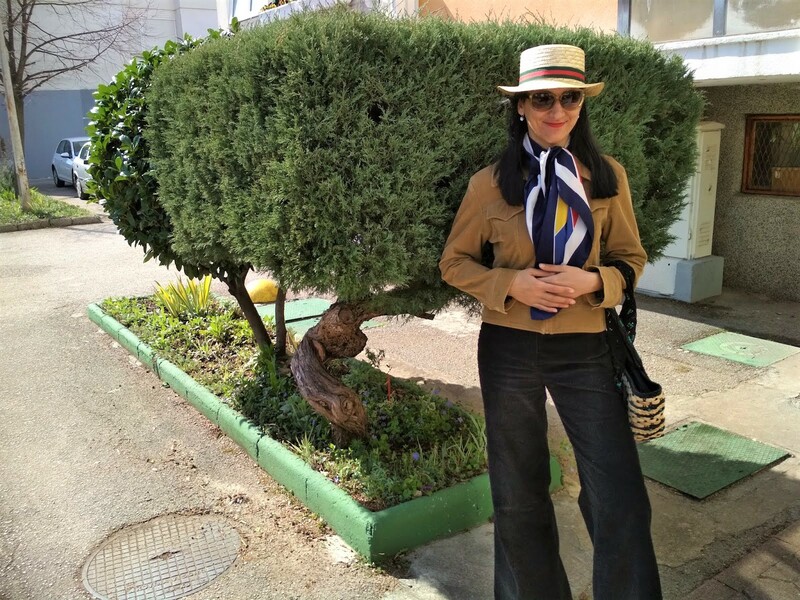 I think a nice foulard can be perfect for creating that spring chic as well, especially if it has an interesting print. I've bought these cord flare jeans recently but I used to have a vintage pair of cord jeans that looked just like it and I wore that pair until it fell into pieces. The cord jacket I'm wearing is vintage. You had the chance of seeing this vintage cord jacket many times, because I wear it all the time. In context of this outfit, a beige jacket seems a good match with straw accessories. I will have to make a mental note of that. I bought this hat last year and the bag as well. If I remember well, both were a bargain. I like the contrast between black and beige. The straw bag has a lot of black in it, and some blue (as does the foulard). I always get questions about this foulard. I think this foulard was originally gifted to my mother by the ambassador of Netherlands or something like that. I know it was some kind of diplomatic gift. Anyhow, I've been wear it non stop for more than a decade. Isn't it great when you find an accessory you love and want to wear all the time? When I think of my go to pieces, I have to think of accessories as well. They can make such a difference, can't they? I really like this straw bag as well. When straw bags became popular, I decided to wait until I found one that seemed unique and so I waited until I found this beauty (and that was towards the end of last summer). I plan to wear this straw bag (and other straw accessories) a lot this spring and summer. 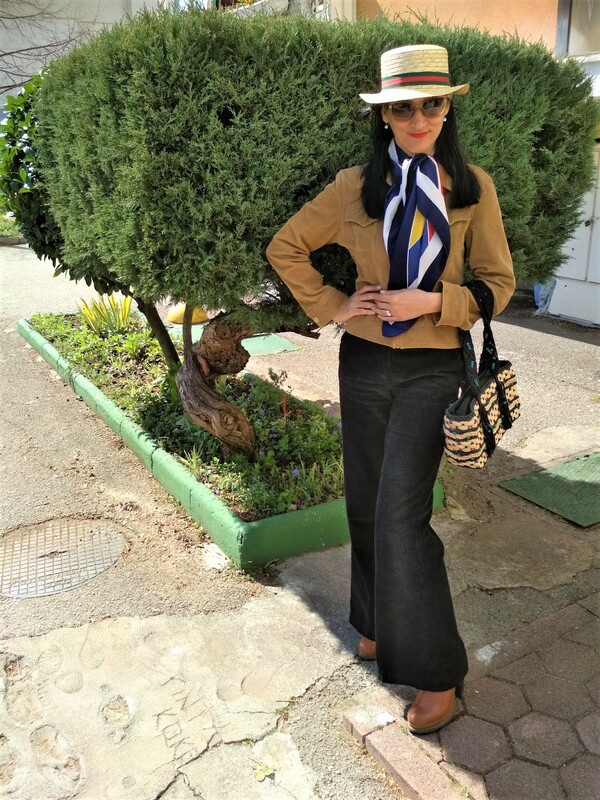 I just love how straw accessories can dress down an outfit and make it seem more casual and relaxed. It's all about those vacation vibes, isn't it? Take a look at the outfit bellow. Do you notice how these two straw accessories (the straw hat and the straw bag) dress down this white graduation dress perfectly? This one shoulder white dress with lace details is a party/cocktail dress really, but with straw accessories it can be turn into everyday wear. This is a neat trick if you want to create a feminine spring styling. Wear a statement dress or a skirt and then dress it down with straw accessories. Who knew that special occasion dresses can be simply perfect to create romantic and feminine spring outfits, right? That's the beauty of spring. If you have any cocktail dresses or even bridesmaid dresses in your closet, consider dressing them down for everyday. Give it a try! 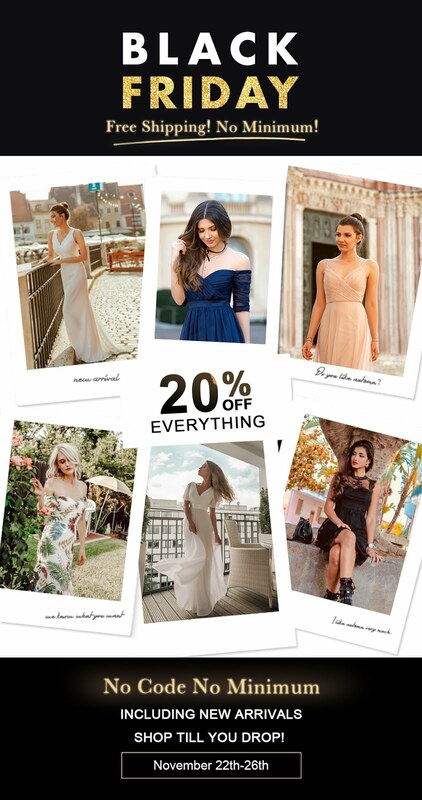 You can even check out these graduation dresses to see if you can find something you like, whether or not you're actually shopping for a graduation dress. Thank you for reading. Let me know what you think about straw accessories? Have you already started wearing your straw bags? Have a lovely day! I loveeee straw accessories, hats, bags, everything. And I must say to you you look like a parisian girl with that foulard that was gifted to your mother by the ambassador how chic woman!! Those white dresses are beautiful and I noticed they are accessorized by straw itnes aren't they lovely? I love it!! Thats a perfect match. thank you. I think that's a good match too! It's a great idea to start wearing straw now! Alla fine è uscio fuori un look molto armonioso e che mi ricorda gli anni 70! I've never even considered brining out my straw hats in the spring but seeing how fabulous the outfit you styled with yours looks, I'm inspired to do the same. Your straw bag is super cute too. I love straw for the warmer weather. Your look is so fun and sassy! I always think of corduroy as classic in a wardrobe. The white dress and accessories are adorable. I do too, for me it is definitely a classic. How perfect to pair them with corduroy. I have a pair and should pull them out one more time before it's too hot. yes, soon it will probably be too hot for corduroy, so we should wear it now when the spring is still young. What a wonderful tip! I dread shopping for special occasions because I only wear it once or twice. To pair it with casual pieces is a brilliant idea. 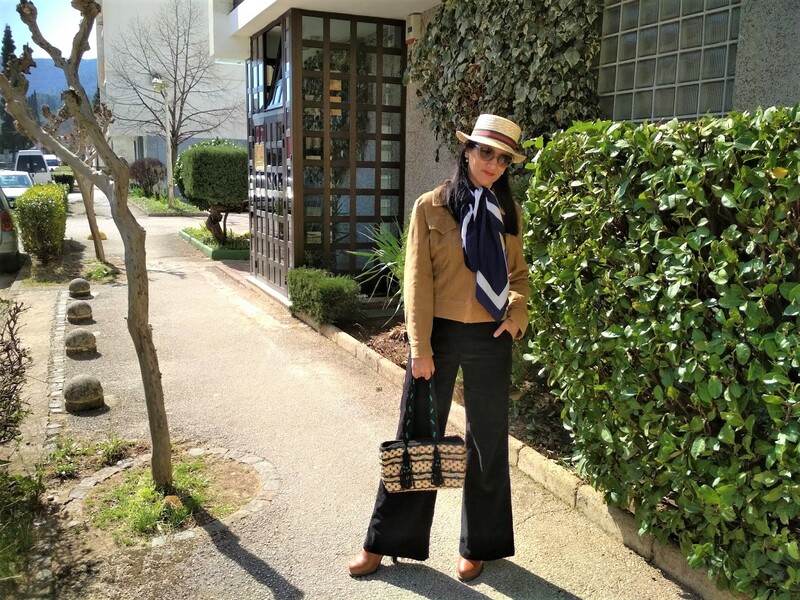 I love your straw hat and handbag and how you paired them with the corduroy. Have a great weekend. thank you Maria. Yes, wearing special occasion stuff with casual pieces is a good way to make most of our closets. Sto cercando da un pò un cappello con a falda piatta (come quello della ragazza nella foto insomma) ma ancora non sono riuscita a trovarne uno che mi stia bene, speriamo di avere più fortuna quest'anno! 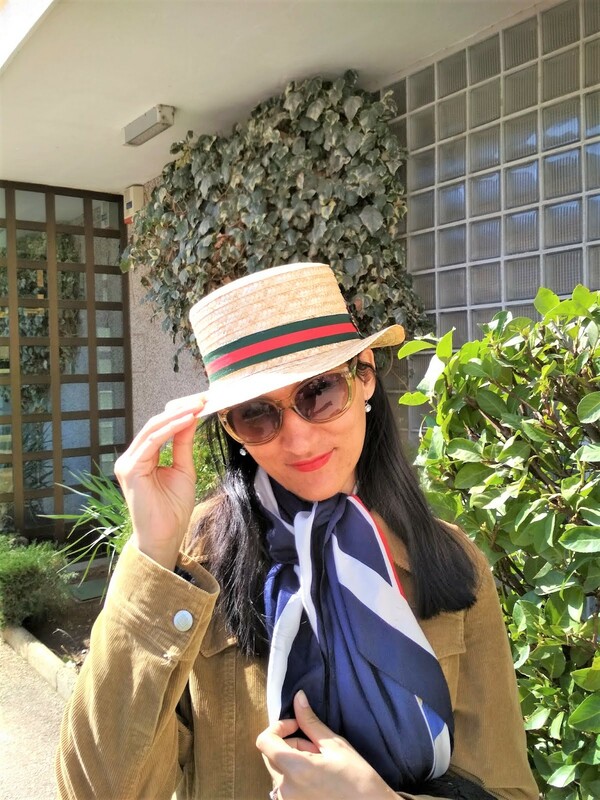 Super carino e molto stiloso il tuo look, mi piace molto il cappello di paglia abbinato al foulard di seta, fa così vacanziaera chic! Sei sempre bellissima ed elegante! I love my straw bags and hats, they are in hibernation at the moment! thanks Allie, yes cord in pastel version sounds lovely. Such a great outfit for a cooler spring day - I think the scarf was a nice touch! It is autumn here but I'm just waiting for autumn weather to arrive properly so I can get my scarves out again, haha! Still too hot to layer. thank you Mica. I love how you wear your scarves. I love straw accessories and probably should have waited like you until something really caught my eye. I've brought and returned so many bags over the last couple of months. Nothing has really wowed me yet and the ones I've brought I've been disappointed in the quality. The search will continue I guess. I also love the story behind your scarf. What a gorgeous piece and what a story to accompany it. I can safely say my mother (nor I) has never received anything of note from any dignitary! Hahahaha! It is hard to find the perfect straw bag, it took me a long time as well! Slatka moderna kaubojka :) Obozavam slamnate sesirice, do sad sam ih nosila samo leti, ali na tvom primeru vidim i da su skroz slatki i u prolecnim kombinacijama.